Data-driven solutions provider NewBay today announced that its brand AV Technology has been recognized by the Jesse H. Neal Awards in the prestigious category of Best Media Brand, Overall Editorial Excellence. NewBay surrounds engaged audiences through trusted brands delivering high-ROI marketing solutions to 4,000-plus clients. The Neal Awards, produced by the Software & Information Industry Association (SIIA), honor editorial content excellence and are considered business journalism’s most important accolades. 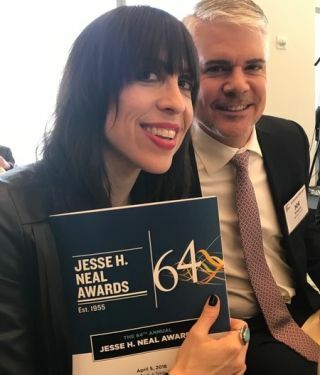 “I am sincerely honored and grateful to be recognized by the Neal Awards,” said Margot Douaihy, content director, AV Technology, winner of best media brand. “In every edition we publish, every live event we produce, and every asset we create, the AVT team endeavors to bring integrity and value for technology managers." Douaihy will be moving to the role of editor-at-large on April 9, 2018, and Matt Pruznick will succeed her in leading the publication. Neal Awards entries are scored in three areas: journalistic enterprise, extent of service to the field, and editorial craftsmanship. Winners were announced at the awards ceremony in New York on April 5, 2018.